Orders go in monthly now! Check with your salesperson for the next deadline. Our Accent Decor monthly order program has been a monster success for us. Although they offer some of the most well-priced and spot on styling, both the freight and breakage problem can be a killer. We solve both those problems for you! 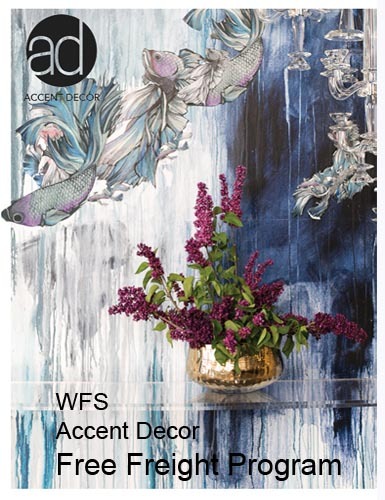 Each month we consolidate your Accent Decor orders with ours, and bring them all in to our warehouse for distribution. Everything is palletized and secure, so breakage isn't a problem. Since we bring in such large quantities, so that killer freight ends up not costing you a thing. All this - at Accent Decor's catalog price.